Official synopsis: "Seventeen-year-old Elliott hasn't slept properly for six months. Not since the accident that nearly killed him. Now he is afraid to go to sleep. Sometimes he wakes to find himself paralysed, unable to move a muscle, while shadowy figures move around him. Other times he is the one moving around, while his body lies asleep on the bed. According to his doctor, sleep paralysis and out of body experiences are harmless - but to Elliot they're terrifying. Convinced that his brush with death has opened up connections with the spirit world, Elliott secures a live-in job at one of England's most haunted locations, determined to find out the truth. There he finds Sebastian, the ghost of a long-dead servant boy hanged for stealing bread. He also meets the living, breathing Ophelia, a girl with secrets of her own. She and Elliott grow closer, but things take a terrifying turn when Elliott discovers Sebastian is occupying his body when he leaves it. And the more time Sebastian spends inhabiting a living body, the more resistant he becomes to giving it back. Worse, he seems to have an unhealthy interest in Ophelia. Unless Elliott can lay Sebastian's spirit to rest, he risks being possessed by him for ever, and losing the girl of his dreams..."
I'll start this review by saying that I LOVE Michelle Harrison! Everything she's written so far has been just simply incredible. From The Thirteen Treasures, to The Thirteen Curses and The Thirteen Secrets, till now, with Unrest, she just knows how to hook you right from the very start. Unrest is the tale of Elliot Drake. He's seventeen, and a few months ago, he nearly lost his life in a car accident. Just when he thought he'd be able to get back to some sense of normality, it all goes horribly, horribly wrong. He starts seeing things, things he wishes that he couldn't. It all happens when he sleeps. He see's his poor, defenceless body, and he's powerless to stop the dead that want to take it over. I will say, that this book is not for the faint-hearted. It is downright terrifying. I even had to stop reading at a few points, because it was nearing bed time and I wanted a good nights sleep, nightmare, and hopefully ghost free! The images, the ghosts themselves. The bathtub... I'll say no more, other than SCARY! However, the fact remains that once you start, you just can't stop! What I love about the book is its reality. Yes, we're dealing with ghosts - there are those that believe, and those that brush it off as tricks of the mind, but there's more to the book than just that. The characters are all well fleshed out. I love that Elliot isn't perfect. He's far from it. He's had his troubles, he's got a bit of a reputation with the ladies, and he's not exactly going to be awarded a Son of the Year award, but that's what makes him so loveable. He's flawed, just like everyone else, so he is fairly easy to relate to. Michelle's writing as always is brilliant. Rich, engaging - the voice in this book is just perfect! 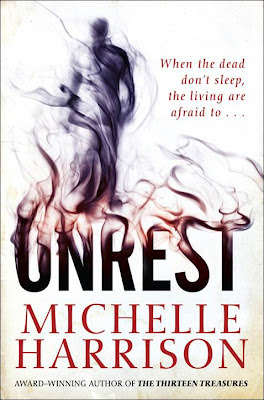 I love when you read a book and the writing is just so seamless, it flows, and Unrest, and indeed all of Michelle's previous work, is a good example of that. You'll be hooked right from the very start. Bring a torch, but it's about to get pretty dark and scary up in here! You have been warned. I haven't read this yet but I'm really looking forward to it. Love Michelle's books. Fab review! I really must get around to reading this one as well. I have a copy on the shelf just waiting for me.